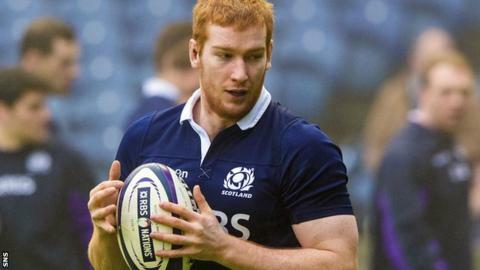 Flanker Rob Harley says Scotland will be under intense pressure to defeat Italy having kicked off their Six Nations Championship with two defeats. Having lost to France in Paris and Wales at Murrayfield, the Scots next host the winless Azzuri on 28 February. "I think there's going to be a massive expectation," Harley told BBC Scotland. "We've not got the results we wanted from the first two games, so it puts pressure on us for the third match, but the advantage for us is a home crowd." Following the 15-8 reverse in Paris with Sunday's 26-23 defeat by Wales, the players, stated Harley, are itching to set the record straight. "I think probably most guys in the squad would want to go out right now if we had the option," said the 24-year-old. "But in some ways the two weeks will be good; we'll get the bodies healed up and use them so that, come Italy, we're fully prepared." Scotland topped last year's tournament standings for penalties conceded with 60 infringements and, after conceding 25 penalties in the two games played in the current campaign, could match that figure in 2015. "The way the ruck is, there isn't a black and white - that's a penalty for the attack, that's a penalty for the defence," said Harley. "They're very fine margins. Sometimes you're on the right end of that, sometimes the wrong end, but both teams have to adapt to the way the referee sees the breakdown. "It's something we'll work on during the week: the technique of being legal, how you're rolling out, so you're not giving referees the option. Technical things we can do to avoid penalties." Scotland have earned praised for improved performances under coach Vern Cotter and Harley is adamant that they are turning a corner. "We've had two defeats by small margins, but we have to take the positives out," he said. "Some of the ways we attacked, the pressure we put on from the driving maul and, when we got going in the finish zone, we were ramping up the pressure and really squeezing them on their line. "The guys have confidence playing with each other, we've got the belief to trust each other in any game and beat the opposition in front of us. "We know mistakes will happen, but we're always trying to play to our very limits, push our limits, and constantly improve. "I think we've shown we can score from anywhere on the park. We just need to be more clinical when we get those chances to attack and get near the line."